Dentistry is the medical field concerned with the treatment and care of the teeth, the gums, and the oral cavity. This includes treating teeth damaged by tooth decay, accidents, or disease. Dentistry is considered an independent medical art, with its own licensing procedure. Orthodontics is the branch of dentistry concerned with tooth problems such as gaps between the teeth, crowded teeth, and irregular bite. Periodontics, another branch, focuses on gum problems. Dental disease has been one of the most common ailments known to humankind. Ancient men and women worked hard to alleviate dental pain. As early as 1550 B.C. , Egyptians used various remedies for toothache, which included such familiar ingredients as dough, honey, onions, incense, and fennel seeds. The Egyptians also turned to superstition for help in preventing tooth pain. The mouse, which was considered to be protected by the Sun and capable of fending off death, was often used by individuals with a toothache. A common remedy involved applying half of the body of a dead mouse to the aching tooth while the body was still warm. The Greek physician Hippocrates ( C. 460– C. 377 B.C. ), considered the father of medicine, believed that food lodged between teeth was responsible for tooth decay. He suggested pulling teeth that were loose and decayed. Hippocrates also offered advice for bad breath. He suggested a mouth wash containing oil of anise seed, myrrh, and white wine. Clean teeth were valued by the ancient Romans. Rich families had slaves clean their mouths using small sticks of wood and tooth powder. Such powders could include burned eggshell, bay leaves, and myrrh. These powders could also include more unusual ingredients, such as burned heads of mice and lizard livers. Earthworms marinated in vinegar were used for a mouth wash, and urine was thought of as a gum strengthener. The Chinese were the first to develop an amalgam (mixture of metals) filling, which was mentioned in medical texts as early as 659. The Chinese also developed full dentures by the twelfth century and invented the toothbrush model for our contemporary toothbrushes in the fifteenth century. The writings of Abu al-Qasim (936–1013), a Spanish Arab surgeon, influenced Islamic and European medical practitioners. He described surgery for dental irregularities, the use of gold wire to make teeth more stable, and the use of artificial teeth made of ox-bone. Abu al-Qasim (also known as Abulcasis) was one of the first to document the size and shape of dental tools, including drawings of dental saws, files, and extraction forceps. Amalgam: Mixture of mercury and other metal elements used in making tooth cements. Bridge: Partial denture anchored to adjacent teeth. Denture: Set of false teeth. Orthodontics: Branch of dentistry concerned with tooth problems such as gaps between the teeth, crowded teeth, and irregular bite. Periodontics: Branch of dentistry focusing on gum problems. Periodontitis: Gum disease involving damage to the periodontal ligament, which connects each tooth to the bone. Plaque: Deposit of bacteria and their products on the surface of teeth. The father of modern dentistry is considered to be French dentist Pierre Fauchard (1678–1761). Fauchard's work included filling teeth with lead or gold leaf tin foil. He also made various types of dentures and crowns from ivory or human teeth. In his influential writings, Fauchard explained how to straighten teeth and how to protect teeth against periodontal damage. Fauchard also took aim at some of the dental superstitions of the day, which included the mistaken belief that worms in the mouth played a role in tooth decay. The development of many dental tools and practices in the nineteenth century laid the groundwork for present-day dentistry. Many of the great advances were made by Americans. The world's first dental school, the Baltimore College of Dentistry, opened in 1847. Around this time, anesthesia such as ether and nitrous oxide (laughing gas) was first used by dentists on patients having their teeth pulled. The practice of dentistry was further changed by the development of a drill powered by a foot pedal in 1871 and powered by electricity in 1872. Another major discovery of the era was the X ray by German physicist Wilhelm Conrad Röntgen (1845–1923) in 1895. The first X ray of the teeth was made in 1896. 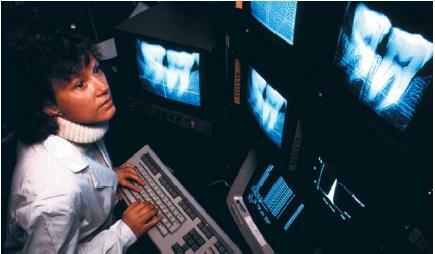 Contemporary dentists continue to use X rays extensively to determine the condition of the teeth and the roots. Dental cavities, or caries, are perhaps the most common type of present-day oral disease. Cavities occur when bacteria forms a dental plaque on the surface of the tooth. Plaque, which is sticky and colorless, is a deposit of bacteria and their products. After the plaque is formed, food and the bacteria combine to create acids that slowly dissolve the substance of the tooth. The result is a hole in the tooth that must be filled or greater damage may occur, including eventual loss of the tooth. filling a cavity typically begins with the dentist using a drill or a hand tool to grind down the part of the tooth surrounding the cavity. The dentist then shapes the cavity, removes debris from the cavity, and dries it off. A cement lining is then added to insulate the inside of the tooth. The cavity is filled by inserting an amalgam or some other substance in small increments, compressing the material soundly. Teeth are usually filled with an amalgam including silver, copper, tin, mercury, indium, and palladium. Other materials may be used for front teeth where metallic fillings would stand out. These include plastic composite material, which can be made to match tooth color. Teeth that have large cavities, are badly discolored, or badly broken are often capped with a crown, which covers all or part of the damaged tooth. A crown can be made of gold or dental porcelain. Dental cement is used to keep the crown in place. Bridges are devices that clasp new teeth in place, keep decayed teeth strong, and support the teeth in a proper arrangement. Some are removable by the dentist, and may be attached to the mouth by screws or soft cement. Others, called fixed bridges, are intended to be permanent. Dentures, a set of replacement teeth, are used when all or a large part of the teeth must be replaced. New teeth can be made of acrylic resin or porcelain. A base in which to set the teeth must be designed to fit the mouth exactly. An impression of the existing teeth and jaws is taken to form this base. Modern dentists generally use acrylic plastics as the base for dentures. Acrylic plastic is mixed as a dough, heated, molded, and set in shape. Gum disease is an immense problem among adults. Common gum diseases include gingivitis and periodontitis. Gingivitis is the inflammation of gum tissue, and is marked by bleeding, swollen gums. Periodontitis involves damage to the periodontal ligament, which connects each tooth to the bone. It also involves damage to the alveolar bone to which teeth are attached. Periodontitis and gingivitis are caused primarily by bacterial dental plaque. This plaque includes bacteria that produces destructive enzymes in the mouth. These enzymes can damage cells and connective tissue. Untreated periodontal disease results in exposure of tooth root surfaces and pockets between the teeth and supporting tissue. This leaves teeth and roots open to decay, ending in tooth loss. When damage from the disease is too great, periodontal surgery is performed to clean out and regenerate the damaged area. The position of teeth in the mouth can be shaped and changed gradually using pressure. To straighten teeth, dentists usually apply braces. Braces are made up of a network of wires and bands of stainless steel or clear plastic. The bands are often anchored on the molars at the back of the mouth and the wires are adjusted to provide steady pressure on the surface of the teeth. This pressure slowly moves the teeth to a more desirable location in the mouth and enables new bone to build up where it is needed. Braces are usually applied to patients in their early teens and are worn for a specific period of time. hi guys. I am a studend. I study Dental school. I need the dental amalgam picture. I'm a 59 y/o female with periodontal disease. (which runs in my family). Why should I pay thousands of dollars to have periodontal surgery that might not fix the problem to where it will reoccur instead of pulling them all and getting false teeth? Can any reputable DDS please answer this question?